The minimum card and letter size for a US Postal Service mailing is 3-1/2" x 5". Most fabric postcards made by quilters measure 4" x 6" and can be mailed using one self-adhesive first class stamp. Keep your postcards 1/8" or less thick to stay within weight limits. Postcards over 1/4" thick usually weigh more than the minimum and they also require an extra fee for the increased depth. Fabric postcards typically have a top decorative layer, a middle filler (somewhat like the batting in a quilt) and a backing. 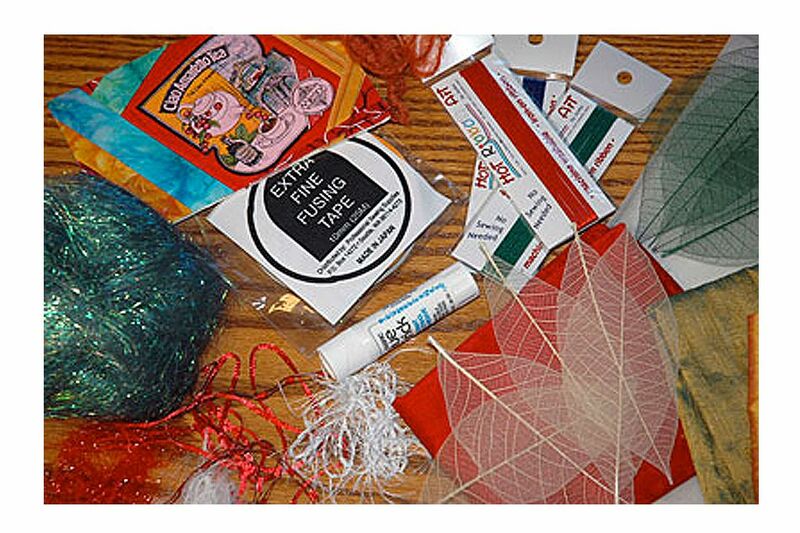 One popular filler choice is fast2fuse, a stiff material with fusible web on both sides. Use the regular weight of fast2fuse for postcards because the heavy version is thicker and will increase postage costs. Timtex is another rigid product that works as a filler. It does not include fusible web—you'll need to add it to the reverse sides of card fronts and backs. You can use flannel or a thin batting as a filler, but the postcards will not be as rigid. The fusible web on the backs of your other components will stiffen up the cards a bit, but probably not quite enough to allow easy flow through the postal system. Try ribbons and buttons, laces and trims or pictures printed on fabric. Explore scrapbooking supplies for design elements, like the green and ivory leaves in the photo above. Angelina fibers are another decorative option. Other fabric postcard supplies depend on the types of cards you make but include paper-backed fusible web, decorative machine threads, and polyester filament thread. The fabric postcard shown above was string pieced. Fussy cut a picture or motif from any fabric. This measured about 3-3/4" x 4 1/2" and was cut from the front of a cloth bag that originally held tea bags. Arrange the cutout right side up on a piece of muslin that's approximately 4-1/2" x 6-1/2", placing it at an angle and slightly off-center. Hold the motif in place with a straight pin or affix it permanently to the muslin with fusible web. Cut several strips of fabric that you think will look good with the focal fabric. Choose different widths for the best variety. Place a fabric strip right side down along the angled top edge of the focal fabric, matching raw edges. Trim the strip so that its width is about the same length as the pictorial's top. Sew together with an approximate 1/4" seam allowance. Press to set the seam and then flip the strip right side up and press into place. Place a second strip right side down along the bottom of the focal fabric, aligning edges and trimming if necessary. Sew together and press as before. Continue adding strips to the top and bottom until fabric extends past the top edges of the muslin. Place a strip right side down along one side of the focal fabric. The strip should extend past the top and bottom edges of the muslin and should also cover the raw side edges of the top and bottom strings. Sew and press as before. Add additional strips, stopping when the fabric stretches just past the side edge of the muslin. Add fabric strips to the other side of the pictorial using the same method. Add lace, ribbons, trim and decorative stitches along seam lines or in any other location. Layer the postcard front with filler and backing (step 3) and fuse binding to its edges (step 7). You can also encircle the focal fabric with strips just like we do when we make log cabin quilt blocks. The front of this fabric postcard was made from a vintage handkerchief. One corner of the hanky's scalloped edge was left intact and the rest was trimmed so that the floral design would trail off on the opposite edge of the card. Cut out the area of the floral hanky you would like to use. We cut a section from the corner of mine, making it about 3-1/2" wide and 4" tall to allow placement flexibility. Cut the background fabric. We used two fabrics, one to the left of the hanky and one to its right. We cut a 4-1/4" square of pink print fabric for the left section. Following the manufacturer's instructions, press the reverse side of the hanky to paper backed fusible web, such as Wonder Under. Place the hanky on top of the fabric, leaving a fabric border about 1/2" or so beyond the top and left edges. Fuse to the fabric. Press the reverse side of the two-fabric unit to paper backed fusible web. Trim to remove excess fusible web along straight sides if necessary. Use sharp scissors to cut out motifs along the hanky's right edge, or simply cut a series of gentle curves along that side of the hanky. Cut through all layers. Cut your second background fabric, a rectangle that measures about 4-1/4" x 6-1/4". Place the floral unit on top of the new rectangle, letting the hanky unit drop down 1/2" or so from the top and left sides. Fuse. Cut a 4-1/4" x 6-1/4" piece of fast2fuse and a postcard back of the same size. Sandwich the three layers, with the fast2fuse in the center and reverse sides of other pieces touching it. Trim to measure 4" x 6" and finish the edges with a narrow satin stitch. This fabric postcard was made from a photograph printed on cloth. We used Photoshop to manipulate the picture before adding white text. We saved the photo at 300 dots per inch, sizing it to fill an area slightly larger than 4" x 6". Press paper-backed fusible web to the back of a piece of fabric and feed the fabric through a color laser printer. Sprayed lightly with Krylon Fixatiff. Sandwich fast2fuse between the card's front and back and trim the card to 4" x 6"
Add a fused binding or other edge finish (page 7). This fabric postcard was made from random bits of fibers and has a batik background. A spool of clear, fine polyester thread. Angelina fibers, available in many colors. Follow the manufacturer's instructions to manipulate the fibers. A piece of batik fabric that measures about 4-1/2" x 6-1/2". Bits of lace, yarns, and other materials you would like to use on the card's front. Arrange embellishments on the front of the fabric. Use a glue stick to hold (some) embellishments in place. Thread your sewing machine with a high-quality polyester thread, such as YLI's Wonder Invisible Thread. Use a zigzag stitch to attach yarns and laces to the card front. Cut a piece of sheer organza to match the size of the card front. Press ​paper-backed fusible web on one side of the organza. Remove the paper and press the sheer fabric to the front of the card, sticky side of the fusible down. Keep adhesive off of your iron and ironing board by placing a press cloth or sheets of parchment paper between the card and the iron. Remove the paper backing and machine quilt the postcard. Cut fast2fuse and a postcard back as explained in previous instructions. Trim to measure 4" x 6" and finish the edges. Using a plain back makes it easy to trim the card since you don't have to worry about lopping off pre-printed lettering. But there are plenty of other options for the backs of your fabric postcards. Print the return address, the recipient's name and address, and even your message on light fabric and cut the areas into rectangles or other shapes. Fuse or zigzag stitch the shapes to appropriate areas on the back of the card. Make a back that's as decorative as the postcard front. Use printed backs for the cards. Download samples in PDF format. You can finish the edges of your postcard with quick and easy fused binding. You'll need 5/8" strips of fabric if you like a 1/8" binding on the front of postcards. Use 1" strips if you prefer 1/4" binding. Cut a total strip length of about 22 inches for each 4" x 6" postcard. Fuse fabric to the tacky side of the paper-backed fusible web. Cut strips as needed. Remove papers. Cut two strips just slightly longer than the short sides of your fabric postcard. Place a strip right side down along the side of the card, raw edges matched. Sew together with the seam allowance width of your choice. Flip the strip right side up and bring it over the edge of the card. Hold in place and fuse it to the postcard back. Repeat on the opposite side. Trim fabric flush with the postcard at strip ends. Cut two strips that are about 1" longer than the long sides of your fabric postcard. Center and sew a strip to one long edge of the postcard as you did the shorter side strips. Flip the strip open but do not press in place yet. Referring to the photo above, trim a portion of each strip end, leaving little fabric flaps across from the seam allowance on each side. The flaps are tidier with 1/4" seams than they are with narrower seam allowances. Fold each flap over the sides of the card, holding them in place with straight pins. Fold the rest of the strip down over the back of the card, covering the seam allowance and the side flaps. Repeat on the opposite side of the postcard. If you prefer, use the same method to sew fabric ribbon to postcard edges. Forget the binding and use any type of decorative stitch to finish the edges of your fabric postcard. Satin stitching and other types of machine embroidery are favorites.